Born in 1991 in Annecy, France, Guillaume Vincent started learning the piano at the age of 7, and gave his first recitals and concerts with an orchestra when still only 10. His talent was soon noticed by François-René Duchable, who encouraged him to audition for the Conservatoire de Paris, which he joined aged 13, in the class of Jacques Rouvier and Prisca Benoit. He also studied piano with Jean-François Heisser and Marie-Josèphe Jude and harmony with Yves Henry. In June 2011, he obtained his Diplôme de 3e Cycle d’Artiste Interprète. 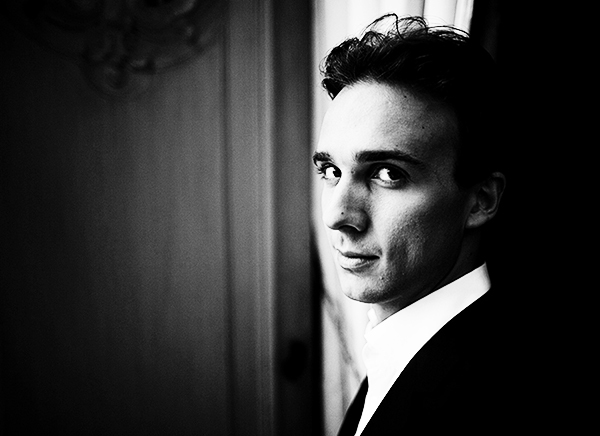 In 2008, Guillaume Vincent won the first prize at the Young Concert Artists competition in Leipzig. Then, the following year, he was awarded the third prize at the Marguerite Long-Thibaud competition and the Prix de l’Orchestre National de France. He then became ADAMI’s “Classical Revelation” and was named Instrumental Soloist Revelation at the Victoires de la Musique Classique in 2014. Guillaume Vincent has performed as a soloist on such prestigious stages as the Suntory Hall in Tokyo, the Barbican Hall in London, the Théâtre des Champs-Elysées, the Salle Pleyel, and the Salle Gaveau in Paris, the Palace of Arts in Budapest, the Qatar Opera House in Doha, or the Simón Bolívar Hall in Caracas… What is more, he has collaborated widely with such orchestras as the Frankfurt Radio Orchestra, the Budapest Philharmonic Orchestra, the Kanazawa Orchestral Ensemble and Philharmonic Orchestra, the Orchestre National de Bordeaux, the Orchestre National du Capitole de Toulouse, the BBC Symphony Orchestra or else the Orquesta Sinfónica Simón Bolívar. As a recognised chamber musician, Guillaume Vincent regularly shares the stage with Augustin Dumay, Renaud Capuçon, Lise Berthaud, Edgar Moreau, Jean-François Heisser, David Kadouch, Jonas Vitaud, Virgile Boutellis or else the Hermès and Ardeo quartets. Among the festivals where he is frequently invited, mention can be made of the Lille Piano Festival, Piano aux Jacobins in Toulouse, l’Esprit du Piano in Bordeaux, and the Festivals of Deauville and of La Roque d’Anthéron. His first solo album, devoted to Rachmaninov’s Preludes, was released in 2012 by Naïve. The Warner recording made with Camille and Julie Berthollet became Disque d’Or in 2015.